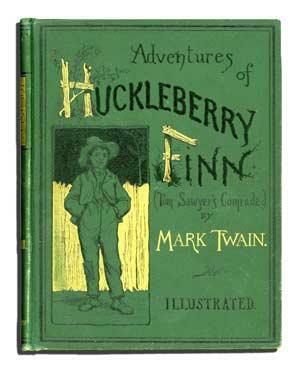 Bookride: Mark Twain. Huckleberry Finn, 1885. VALUE? The UK first is worth about a third of the US, but serious collectors like to have both. There is the story of the dealer who bought a copy privately lacking the front endpaper, when he remarked on this to the seller the chap said 'Yeah that had to go, some guy called Clemens wrote his name on it.' (An old chestnut-- sometimes it's Alice and 'some guy called Dodgson.') A first state copy in superior condition made $33,000 in 2003 ( "A splendid, well-preserved copy.") Most very high records are reserved for signed presentations from the author. The great L.A. dealer Biblioctupus forked out $85,000 in 1988 for a presentation copy from Twain to his wife dated Christmas 1884, also signed again on front pastedown. Fittingly it was the Doheny copy - among the points noted was that the engraving of Silas Phelps's trousers fly was in original state with "definite curve". Much is made of the bulge or lack of it in Silas's trousers and it was later replaced with a straight vertical flat fly. A question of decency. Twain's own signed copy came to auction in 2005 making circa $100K in the original publishers sheep binding. These have generally not lasted well - this one was chipped & cracked along joints & extremities. It can also be found in original three-quarter leather. Webster bound up 500 copies thus and 2500 in sheep. There are facsimiles of the first that occasionally turn up online with persons trying to sell them as the real thing; the first clue that something is wrong is that they are in unnaturally fine condition with bright white fore edges, don't be fooled. Last word on Twain--I recall that when he was hanging out with the cannibals (to write an article) he said something like 'I suppose you would like to eat me too' and was politely informed that the flesh of a heavy smoker and drinker was unpalatable to them. There was also a battered copy that sold a few weeks ago on EBay for $686, seems like the market may be a bit soft for this book at present.